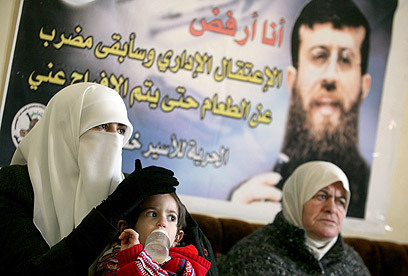 Knesset Member Ahmad Tibi (United Arab List-Ta'al) said Tuesday that Palestinian administrative detainee Khader Adnan has "come out a winner" after the State announced he is to be released next month. The Islamic Jihad operative, who has been held in Israel without charge since December, ended a 65-day hunger strike earlier Tuesday when the State Prosecutor's Office said it will not pursue the renewal of his administrative detention. Tibi and MK Mohammad Barakeh (Hadash) made the remark during a ceremony that took place at Adnan's hometown of Arraba in celebration of the prisoner's impending freedom. The event was also attended by senior officials from the Palestinian Prisoner Affairs Ministry. The High Court of Justice was set to convene over Adnan's case on Tuesday, but the hearing was cancelled when the Justice Ministry announced it had reached a deal with Adnan, establishing that he is to be freed on April 17. "This is a worthy agreement that is saving Adnan's life," Tibi said. The lawmaker spoke out against the State's use of administrative detention, and called Adnan's imprisonment "unjustified." 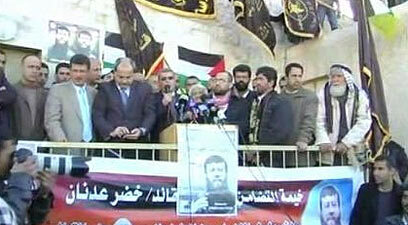 "The hunger strike was his only means of voicing his opposition to the detention," Tibi said. "The whole world was on his side. I'm glad the affair has concluded in a way that prevented a great tragedy." Tibi postulated that Adnan's death would have caused an escalation in the region. Adnan's wife, Randa, told Ynet that his whole family gathered to celebrate the news. She said that she still does not understand the reason behind his arrest, asserting that he does not partake in terrorist activity. "It’s true that he was the Islamic Jihad's spokesman during the intifada, but over the past four years he had nothing to do with it," she said. "He hadn't talked to anyone from the Islamic Jihad. He left that activity altogether." Randa said that her husband has turned into a symbol for the Palestinian people. "He has achieved his goal," she said. "It's a victory not only for him but for all of the Palestinian prisoners who are held in Israel, and especially for the administrative detainees." Adnan's release, which coincides with "Palestinian Prisoners' Day," is to be celebrated with a welcome ceremony in Arraba. See all talkbacks "MK Tibi: Adnan came out a winner"